On February 5-7, 2016, Teach for America (TFA) will host its 25th Anniversary Summit in Washington, DC. Former TFAer Gary Rubinstein wants to fact-check TFA’s marketing of itself at said celebration. To this end, he has created the blog, TFA25FactCheck, as a headquarters for monitoring the TFA glories spouting from its summit– an effort directed toward summit attendees who are also finding themselves with raised eyebrows when hearing about the alleged wonders of TFA. I attended the 20 year TFA alumni summit five years ago, and was surprised by the number of wild claims I was hearing from the featured speakers and panelists. After that conference I spent the next five years examining these sorts of claims and found that they were always untrue or extremely exaggerated. This time around, I want there to be some kind of place where these claims can be shared and I, and others, can research them and post our finding here. For now, I’m thinking that the ‘comments’ will be a good place to have a discussion. Follow @TFA25FactCheck for Twitter Updates and visit this blog, tfa25factcheck.wordpress.com, as the event nears, and most importantly, during the event Friday February 5, Saturday February 6, and Sunday February 7. Conference attendees might be frustrated with the lack of balance in these Saturday sessions. I volunteered to be on a panel, but TFA had no interest in giving me any sort of sanctioned platform. Without counterpoint, these panels will leave off the other side of the story in these complicated issues. This page (along with the comments. Feel free to add your own.) will serve as a centralized place for people to come to if they are in a session or about to go to a session and want to learn what sorts of issues are related to these sessions, some background information that you won’t hear at these sessions, and even some potential questions you could ask the speakers during the Q and A periods. Below I’ve listed the top 10 sessions that you should try to attend if you want to see a display of egotism and compulsive lying. If you do go to any of these, would you please audio record them and email them to the gmail address. And since I believe it worthwhile to share Rubinstein’s informed thoughts on what presenters in these sessions are hardly likely to reveal, including potential deceptions in session titles. This one has four of the biggest name in education reform, Dave Levin and Mike Feinberg are the founders of KIPP. John White is the last remaining TFA alum that is leading a big state or city (Louisiana), and of course Michelle Rhee who was once the face of the reform movement, but is now keeping a very low profile. At the 20 year event five years ago, Rhee was much more prominent, as she had just starred in Waiting For Superman. About two years ago Rhee stepped down as the CEO of StudentsFirst and she hasn’t been heard from since. John White has had a lot of controversy in Louisiana. The data from the schools there is very opaque and White himself was caught saying once that he was deliberately ‘muddying the waters’ about the data there. Check out Mercedes Schneider’s blog and also Crazy Crawfish to learn everything you could ever want to know about John White. The new governor there wants White out but does not have the power to do so. I doubt White will last very long there and I’m hopeful that after he goes there will be a huge audit of all the data he has been hiding. Levin and Feinberg have also been pretty under the radar recently. KIPP schools are not claiming to perform miracles anymore the way the new gold standard in charter schools, Success Academies is. KIPP test scores are pretty mediocre in New York. The thing they like to focus on is about the KIPP college rate. You will hear that 32% of KIPP students graduate college and that this is 4 times the 8% rate for low income students. The thing about that stat is that it is 32% of students who graduate from KIPP. This ignores the fact that 40% of students who begin at a KIPP don’t complete it so they are excluded from that statistic. The short answer to this, of course, is ‘they’re not.’ TFA recruitment is way down. They had 6,000 new CMs two years ago and this year it was about 4,500. Not only that, but the quit rate is up. If asked about this they will say that the economy is better so people are not going into teaching across the board and also that lies about TFA are misleading people into staying away from it. They will not admit that the teacher bashing by their biggest allies are the cause of the teacher shortages and their own recruitment problem. Don’t be misled into thinking that this one admits that out-of-school factors are the major cause of the achievement gap, despite the name. On the panel is Tim Daly, former head of The New Teacher Project, which published the main ‘research’ paper called ‘The Widget Effect’ that reformers use to show that things like test score based merit pay is a good thing. I will bet that this session will be more about parental ‘choice’ to go to charter schools and things like the ‘Parent Trigger’ where a group of parents are manipulated into voting to have their school taken over by a charter. This has always been a disaster wherever it has been tried. The thing to know about this one is that it features one of the most destructive TFA alums – turned policy maker, Michael Johnston. I know Johnston for years and he was once a good guy until he fell in with the wrong crowd known as DFER (Democrats For Education Reform). Now Johnston is the poster child for using a very inaccurate teacher evaluation system called ‘value-added.’ While most states use it for some percent, only Colorado, because of a bill he sponsored SB 10-191, weights it 50%. I know teachers in Colorado and Johnston is not liked by them. That 100% of the students at the school he was principal of went to college. This is a lie. The school had 75 tenth graders and then 45 twelfth graders two years later. If all 45 of those went to college, that is not 100% of the cohort as he likes to pretend. That the teacher’s union supported his bill. There are two teachers unions in Colorado. The one that represents 95% of the teachers there was opposed to this plan while the one that represents 5% of the teachers supported it. I volunteered to be on a panel and since I’m so ‘controversial’ you’d think this would be a good one for me to speak on. But the teachers on the panel are not any reform critics that I’ve ever heard of. What should we do when the whole school fails? This panel has the only reform critic on all the panels that I know of, Steven Zimmer, president of the school board for Los Angeles. It also has one of the most aggressive reform cheerleaders Chris ‘Citizen’ Stewart. Stewart has accused me of being a racist time and time again every time I point out that some ed reformer has lied about how some school has gone from the lowest test scores to the highest in two years just because they fired their staff and replaced them with 22 year old TFAers. This one should have some fireworks, I’m hoping. I’m definitely not thrilled with the title of this since it is never the ‘whole school’ that fails, meaning 0% passing. The two panelists on this are Jon Schnur, who is known as the architect of Race To The Top. 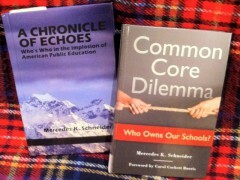 I once met with Schnur at a restaurant and we had a nice two hour conversation. Then he said he’d answer my ‘open letter’ to him but he’d need some time, but he never did so I’m not so impressed by him. The other is Michael Johnston, the golden boy of education reform, who I wrote about in the morning session that he’s moderating. These guys are slick. They make it sound like they are so thoughtful and everything has two sides to it and everything is so complex we can’t commit all the way to one thing or another. But when it comes down to it, they advocate for teacher evaluation to be based on 50% value added. They are also the founders of something called ‘America Achieves’ and their big thing is that it isn’t just poor schools that are ‘failing’ but our wealthier schools are ‘failing’ too. Don’t get wooed too much by these con artists. Truly one of the most awful people in ed reform, Joel Klein mentored four of the most destructive TFA alumni who became leaders for a short period of time before resigning: Michelle Rhee who got run out of DC, Cami Anderson who got run out of Newark, Marc Sternberg who got run out of New York City, and John White who is still in Louisiana, but hopefully not for long. Klein knows absolutely nothing about education which is why after he left New York City he ran a billion dollar ed tech company, Amplify, into the ground and now is working as a lawyer for a big insurance company. His mentees are generally out of the picture after their abrasive styles got them ousted. Rhee is a has-been. Anderson crashed and burned in Newark — I’ve never seen anyone hated by the community as much as her. Amazingly, this panel is moderated than none other than Elisa Villanueva Beard, sole CEO of TFA. Eva Moskowitz is the current darling of ed reform. Her charter schools in New York City are known for their outstanding test results. Actually their test results are so good they make other charter chains look pretty bad. The thing is, and this probably won’t come up, Success Academy is known for making life miserable for families of kids who don’t conform to their ultra strict policies and this includes many special needs students. A few months ago the New York Times revealed a leaked memo there a bunch of kids were on a list entitled ‘Got To Go.’ This has sparked an investigation and a civil rights law suit against them. I actually know someone who had a special needs daughter in Success Academy. She passed the 4th grade state test last year and her family all participated in her graduation ceremony in June to go to 5th grade. Well, when the daughter showed up for school in September, expecting to be in 5th grade, she learned that she was put again into a 4th grade class. Her parents wanted her switched into 5th grade since the girl was devastated to be in 4th grade again and Success Academy said that even though she passed 4th grade, they didn’t feel that she was ready for 5th grade and that if she transferred out she could be in 5th grade at another school. They chose that option and they don’t go there anymore. This shows the length that a school will go to to keep their gene pool pure. The first ever Success Academy class had 80 kindergarteners. Those 80 kindergarteners are now just 20 10th graders. None of those students qualified for any of the specialized high schools in New York City despite it just being a standardized test that gains admission. Success Academy is not a good place. If you go to this, ask Eva about the civil rights lawsuit filed against her and watch her blame it on the mayor and the teachers’ unions. This is the actual title. Tennessee was the first Race To The Top winner. They hired TFA VP Kevin Huffman (Michelle Rhee’s ex-husband) to be commissioner and he hired Chris Barbic, another TFAer I know from my Houston days, to run the Achievement School District, a district that takes over schools in the bottom 5%, turns them into charters, in an effort to get them into the top 25% in five years time. Tennessee had the most ‘gains’ in the national NAEP scores two years ago and though the recent NAEP wasn’t as much growth, they still have the most gains over a four year period in that test so you should expect to hear a lot about that. The thing is that if you look at their state test scores, Tennessee’s reading scores have been dropping for 3 consecutive years. And that ASD experiment, well of the initial 6 schools they took over, they are pretty much all still in the bottom 5% after 3 years. Huffman resigned before he got fired by the new Governor. Barbic resigned conveniently 2 years before he would have to admit that the 5 years to get from the bottom 5% to the top 25% was nothing more than a nice fund raising slogan. And also on this panel, for some reason, is Matt Kramer, the former co-CEO of TFA who resigned last year because it would be good for the organization. As these 10 sessions happen it would be great if people tweeted some quotes to the @TFA25FactCheck twitter account and use the #TFA25FactCheck hashtag. Also feel free to have discussions in the comments on [the TFA25FactCheck] site. On February 5th, 6th, and 7th in Washington DC, TFA will have their 25 year anniversary alumni summit. As a long time alum, I, Gary Rubinstein, have attended the 5 year, the 10 year, the 15 year, and the 20 year summits. The 20th anniversary was a reform love fest complete with a ‘Waiting For Superman’ reunion panel. The keynote speech by Arne Duncan contained such a blatant lie that it launched my blogging career. But in the past five years a lot has changed. Reformers are on the retreat, reform critics are gaining momentum, and social media enables people from around the country and even around the world to influence the flow of information, particularly at a big conference. With this in mind I have created several ways that conference participants can participate in an honest dialogue with not just other participants but with knowledgeable bloggers and others who have been critically following the reform movement over the past five years. The primary way to interact is to use Twitter by using both of the hashtags #TFA25 and #TFA25FactCheck in tweets. This way when conference goers follow the #TFA25 hashtag they will also become aware of the #TFA25FactCheck hashtag. Next, I’ve created the Twitter handle @TFA25FactCheck which I will tweet from during the conference and will also be retweeting relevant information. I hope people in the education activist community will follow this handle and retweet during the conference as a way of making conference goers aware of it. Around the country I’m hoping that many of the great twitter users and bloggers will be answering questions that conference goers tweet to the #TFA25FactCheck hashtag. You can also come to this blog TFA25FactCheck.wordpress.com and leave comments here to have a more detailed discussion about what is happening. If you don’t want to post things publicly, you can also send information to the email TFA25FactCheck@gmail.com. If anyone wants to volunteer to help out with organization or by ‘standing by’ remotely to research and respond to questions people have, that would be great since I’ll be at different sessions and won’t be able to be blogging and tweeting so much. I have a small team of people helping me out, people remotely monitoring the blog and the twitter account. Mainly I’m hoping that things will develop spontaneously as the TFA25FactCheck movement gains momentum. There will be some kind of happy hour meeting on Friday night where you can meet me and other TFA critical alumni — I’ll tweet when and where if you want to join in. I’ll also tweet during the lunch break and other breaks where I’m hanging out so people who want to learn more about why one of the most loyal TFA alumni of all time has become disillusioned with TFA. Here is a link to the open letter to Wendy Kopp I wrote two years ago and also a link to her response. Great use of social media, especially the hashtags that are likely to entice the participants.